Propecia contains the active ingredient finasteride and is used in the treatment of male pattern baldness. Initially, it was used to treat men with enlarged prostates, but men who were using Propecia also found that it had a positive effect on balding. After years of research, Propecia was introduced to the market in a lower dose which was proven to be a safe and effective way to treat male pattern baldness. Propecia is a brand name and not the name of an active ingredient. Finasteride is the active ingredient of Propecia. Propecia is available as a branded version and also as a non-branded (generic) version, which is made by various different pharmaceutical companies. The generic non-branded version is referred to by the active ingredient, finasteride. The branded and non-branded version both contain 1mg of the active ingredient, finasteride. The only difference between the two may be in the inactive ingredients (such as the ingredients used to bind the tablet together). Theoretically, Propecia and finasteride will both give you the same results. Why is Propecia more expensive than finasteride? The pharmaceutical company Merck spent a hug sum of money in the processes leading up to the introduction of Propecia to the market. Merk have therefore set the price of Propecia accordingly, in order to cover the investments made as well as make a profit. Merck held the patent (license to be the sole manufacturer) of Propecia until October 2014. Seeing as the ingredient was already known and the drug had been approved for use in male pattern baldness, after the patent expired, other companies were able to produce finasteride with little investment needed. This is why they are able to sell finasteride for a cheaper price. The many companies producing generic (non-branded) finasteride helps to keep the price competitive. The enzyme 5-alpha reductase is responsible for converting the hormone testosterone to dihydrotestosterone (DHT). DHT stops nutrients from being absorbed by hair follicles causing them to shrink. This results in hair falling out and hair follicles not being able to produce any new hairs. Finasteride, the active ingredient in Propecia, inhibits the enzyme 5-alpha reductase, which blocks the conversion of testosterone to DHT. The lower levels of DHT means that there is less of it to attack hair follicles, slowing and in many cases reversing hair loss. How long does it take for Propecia to work? Propecia's effect on the scalp is immediate. However, it takes around 3-4 months before you notice less hair falling out. At first, you may notice hair shedding more than it did before, however, this is a sign that your body is responsive to Propecia. At around 6-9 months, most men start to see some hair regrowth aswell as less hair falling out than before. After around 12 months, you should be able to notice the difference Propecia has made. It is important to take Propecia continuously for one year without a stop in treatment. This is the most appropriate time frame to give Propecia before deciding whether it is working for you or not. Whilst many men experience hair regrowth using Propecia, some men do not. In these men, Propecia is most likely preventing further hair loss. Why does hair shed at first with Propecia? Men taking Propecia do so with the intention of curbing hair loss and causing hair to regrow. It can therefore be distressing to find that your hair is shedding after having started treatment with Propecia. However, in order for new hair to grow, your old hairs need to shed. Propecia causes the current growth cycle to stop, starting a new healthier growth cycle. Hairs in the middle of a growth cycle with therefore shed and eventually be replaced by new stronger hair strands. Shedding usually occurs within the first three months of treatment and by six months, it should have completely stopped. How do you take Propecia? 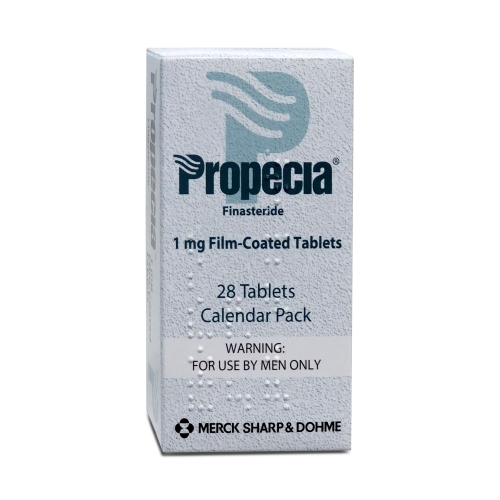 One Propecia tablet should be swallowed whole with a glass of water at the same time each day. It can be taken with or without food and should not be crushed. If a dose of Propecia is missed, it should be taken as soon as you remember. If you do not remember till the next day, do not take two doses together. Propecia should be taken continuously for as long as you wish to benefit from treatment. What happens if I miss a dose of Propecia? Missing a dose of Propecia is something that can happen from time to time. Missing the odd dose here or there will not effect results, however, missing several doses will cause the levels of DHT (the hormone responsible for shrinking hair follicles) to rise, causing the balding process to begin. If you have forgotten to take a dose, take it as soon as you remember. If you do not remember till the following day, do not take two tablets together. Clinical studies evaluating the effectiveness of Propecia over 5 years, showed that Propecia had a success rate of 90%. 42% of men found that they were not losing anymore hair using Propecia, whilst 48% of men experienced hair re-growth, showing Propecia to have a 90% success rate. A similar study conducted over 2 years in 1553 men, showed that over 83% of men suffering from male pattern baldness either maintained or increased the number of hairs from the baseline. Is Propecia safe to take? Propecia is used safely by millions of men, due to its effectiveness and low side-effect profile. Clinical trials have demonstrated that side-effects when taking Propecia are uncommon. Studies evaluating Propecia in 3,000 subjects, showed that only 1.7% of men discontinued treatment due to side-effects. It was reported that during the same study, more men (2.1%) discontinued treatment whilst taking a Placebo pill. After five years of treatment with Propecia, less than 0.3% of men were reported to be still suffering from side-effects, confirming that if you are within the small range of those who experience side-effects, it is likely that they will subside over time. Side-effects are reversible will stop once Propecia is not taken anymore. Propecia is only licensed for use by men. Male pattern baldness is caused when testosterone is converted into DHT (the hormone responsible for hair loss). As women have lower levels of testosterone, Propecia is not as effective in promoting hair loss in women. ​Propecia should be avoided by women, especially fertile women as it can have a harmful effect on the foetus during pregnancy. Propecia is available to buy online from our registered pharmacy. It is also available as a generic version, which medically equivalent to Propecia, but it is not branded and therefore available as a cheaper alternative to Propecia. Before our clinicians can prescribe you with treatment, you will need to fill out a short online questionnaire, which will determine your suitability for this product. Is it safe to buy medication online? Chemist Click are registered with the GPhC (General Pharmaceutical Society) and the MHRA (Medicines Health Regulatory Authority). You should always check the credentials of the pharmacy when buying treatment online. Click here to see our credentials.